There are numerous novels about World War II and the events leading up to it but TheThe Gods of Heavenly Punishment: A Novel comes from a perspective not often seen—that of life in Japan in the late 1930s. Author Jennifer Cody Epstein intermingles the lives of disparate characters that come together and move apart against the backdrop of war. Anton Reynolds is an American architect who has spent over a decade living in Japan, helping to create some of Tokyo’s most impressive buildings. His chief builder is Kenji Kobayashi, a traditional Japanese man who struggles to understand his elegant and high-strung modern wife, Hana. After Pearl Harbor, the Americans in Japan must leave. Anton finds his architectural skills in demand to build replicas of Japanese buildings in the desert which will be used for test detonations of new types of bombs. Kenji goes to Manchuria, formerly of China but now occupied by Japan, and helps build new towns and infrastructure. 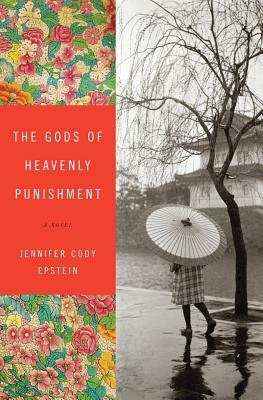 The Gods of Heavenly Punishment moves beyond other war-based novels thanks to Epstein’s ability to look outside the events—the preparations, the mindset, the beliefs—and into the more intimate details of each character’s life. As a young girl, Kenji and Hana’s daughter Yoshi learns of her father’s secret life in a remote village and must manage this knowledge when she returns to Tokyo to take care of her once vivacious mother who is now emotionally and physically fragile. When the Americans bomb Tokyo with napalm in 1945, Epstein captures the larger horror of a panicked teen watching friends and her city explode into flames while her inner terror is at having left her mother alone. Rather than give us characters that are merely impacted by the epic events going on around them, Epstein creates people whose internal battles are just as important. This blending of world and personal makes each aspect of the novel more potent in its intimacy. In the novel the chapters are separated by location, giving the reader the chance to move away from one set of perceptions to another. Because the characters feel so real—in all their political-incorrectness the novel is infused with a flavor that enriches the reader’s experience. Words and sentiments were used that would never be expressed now but even as we flinch there must be acknowledgment that these were the emotions of the time—on both sides. Epstein’s even prose makes judgment of either side difficult. At best, we are left trying to understand the monstrous actions on both sides and the smaller human behaviors in all the characters, not just those who invoke our sympathy. I’ve seen this book kicking around for a while and I am increasingly intrigued by it. Especially the American architect in pre-war Japan aspect. Sounds fascinating. So i guess that means another book is added to the TBR pile! “This blending of world and personal makes each aspect of the novel more potent in its intimacy.” – What a spectacular way to describe why this book was so good! I loved the way the author brought each character to life and thought the different personal views of the war had a huge emotional impact. Definitely very different from your typical war story. The picture book Baseball Can Save Us is another really affecting one on this topic.